There is no doubt that, for many tennis fans, Wimbledon is the most highly anticipated tournament in the tennis calendar. The pristine courts, royal visitors and unconditional support from the masses on Henman Hill make the tournament unmistakable. Amidst the great frenzy, the tennis at SW19 has always provided moments that will long remain in the memory; the 1980 final between John McEnroe and Bjorn Borg, the dramatic finals between Rafael Nadal and Roger Federer and the 2001 victory of Goran Ivanisevic are firmly etched in tennis history. Yet, week one of Wimbledon 2012 has shown that the tournament is well and truly creating a new era; one with the Centre Court roof. Fans on Centre Court were no longer worried about the rain and fading light, but instead were treated to matches of the highest quality. 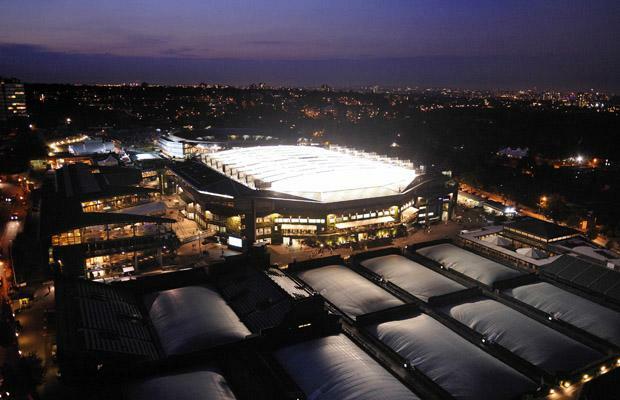 The stunning view of Centre Court with the roof at night. On Thursday night, Lukáš Rosol, ranked at 100 in the world, caused one of the biggest upsets in Grand Slam history by beating the number 2 seed Rafael Nadal in five enthralling sets of tennis. It was a performance that thrilled the crowd. The match began with Nadal winning an evenly matched first set. Then as their close encounter continued, Rosol became the dominant player, reaching an incredible peak in the final set. Nadal had just made the score 2-2 and then the decision was made by Wimbledon referee Andrew Jarrett to close the Centre Court roof. With a long wait for the fifth set to begin, it was possible that Rosol would become nervous about his potential victory. That didn’t happen. Instead, the winners came thick and fast and even the great defence of Nadal had no reply to shots that were consistently around the 90mph mark. So, at a few minutes past ten o’clock, the packed Centre Court crowd were on their feet in admiration for both players, but it was Rosol who took the victory. The next instalment of this epic trilogy came on the following night, when Roger Federer was two sets down against Julien Benneteau. Murmurs of a second upset were hard to ignore. Yet, Roger Federer showed his champion spirit and held his nerve in a fourth set tie-break where the tension was unbearable. He did what Nadal could not and capitalised on his form after equalling the score. In the fifth set, Federer proved to be the worthy victor. Finally, on Saturday fans were treated to another astonishing encounter under the roof. Marcos Baghdatis, the charismatic Cypriot, played the exuberant tennis that made him the Australian Open finalist back in 2006. Baghdatis lost a closely fought opening set but bounced back immediately with a 6-3 win in the second. Then, once again both players were made to wait until the roof came over Centre Court. 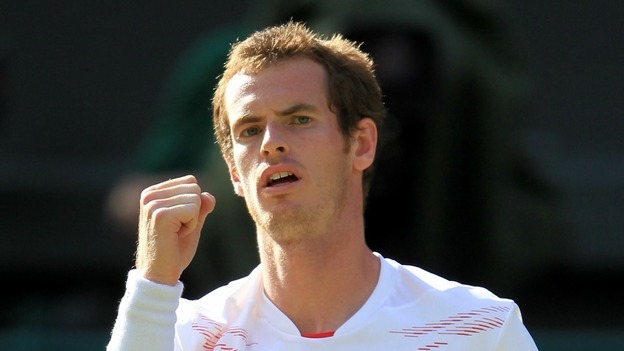 Andy Murray is now one of the favourites to win Wimbledon next Sunday. The 30-minute delay came at a perfect time for the ruffled Andy Murray to regroup and focus; he had fallen over on several occasions already. Before play resumed, it was announced that the match could not go on past eleven (a regulation enforced by the local authorities). With less than two hours left to play it seemed that a return on Monday was inevitable but Murray appeared to relish the race against time. After winning the third set, Murray sprinted to the finish line. As Baghdatis tired, Murray thrived, even refusing to sit down between the final games of the fourth set. The crowd erupted as Murray completed the match just moments after the eleven o’clock deadline. Both he and Marin Cilic, who played for over five hours to beat Sam Querrey on Saturday, will be hoping for a shorter affair when they meet in the fourth round on Monday. Week one has both shocked and entertained everyone following the men’s draw. Perhaps it is time for some epic battles between the top seeds in the women’s game. As the pressure increases, Centre Court will certainly continue to be the theatre for drama in the second week.